Mark Twain was one the most prolific and acerbic commentators on religion and politics of his time. His words are remarkably relevant to today’s headlines, more than 115 years after his death. Twain also knew how to poke fun at himself, a refreshing talent sadly lacking in most public figures today. Inspired by Hal Holbrook’s performances as Mark Twain, Jim Ketcham portrays the iconic American author Monday, Aug. 28 at 6:30 p.m. at Taylor Community’s Woodside Building. A question and answer session follows the performance. This free event is open to the public. 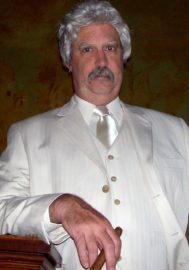 Ketcham began performing as Mark Twain at Chicago Theological Seminary in 1979. He went on to perform for many conferences, churches and civic groups over the years. He is an ordained American Baptist minister. Ketcham currently serves as Executive Director of FOCUS Churches of Albany, a united effort by six congregations from four different Protestant denominations that seek to address poverty and hunger in Albany and beyond through charity and justice.